I wanted to do something special to honor my Mom. She is caring, kind, gentle and always finds the beauty inside each person she meets. So I decided to think back to my favorite memories of childhood and write about them. As I thought back, I kept coming back to memories of warm, long summer days. I decided to simply write about what I remember and to also, write about how those memories are now so important to me as a mother myself, to a beautiful daughter. Once I wrote this poem, I wanted to create artwork and include the poem in the artwork. Perhaps, I will inspire you to remember back to childhood and recount those memories of a simpler time. I would love to hear your memories and poems. Some of my favorite, most cherished memories from childhood involve backyard picnics. I remember warm, sunny summer days, running in the grass and through the sprinkler’s splash. I can still see the sun tea brewing on the top of the sliding board. These days would often be interrupted by a picnic lunch, usually on the screened-in porch, of a peanut butter and jelly sandwich and a glass of milk. I always think back on those days with a happy heart and as the weather warms and the days grow longer, I long for those simple summer days. These summertime memories help me to remember that simplicity is beautiful and that time spent with family is the most precious gift of all. Now that I am a Mom, I am thankful that I get to relive the joy of childhood through the eyes on my beautiful daughter. But I am doubly blessed to know that Faith, too, will have the opportunity to create joyous memories running through the same grass, under the same blue sky where I once played and explored as a child. I have been truly blessed with a beautiful, loving, and caring Mother. And I’ve been blessed again to witness that love grow into a grandmother’s love. I love you Mom. 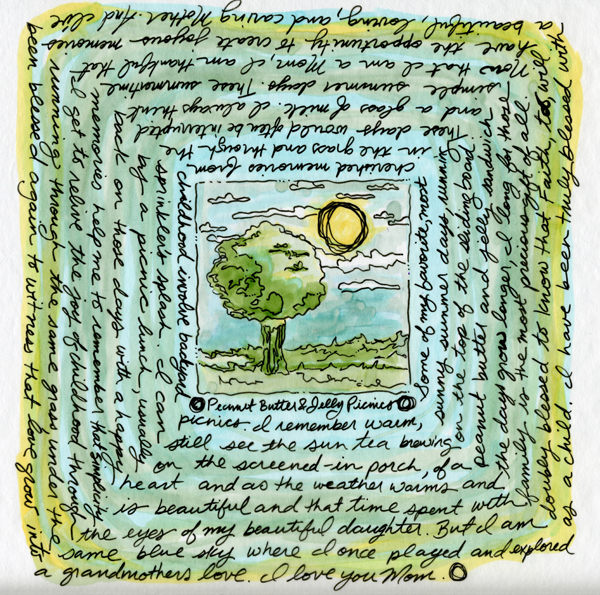 This entry was posted in Vellum, art markers and india ink and tagged artwork, beautiful daughter, cherished memories, india ink, summer days, vellum. Bookmark the permalink.